Finally! I can tell you all about Lush's new Halloween collection available now on the LUSH website. And I gotta tell you guys, this is a fabulous product line. I have personally tested, and given all the LUSH 2010 Halloween items 2 thumbs up. LUSH Lady Catrina Soap ($5.95) The Lady Catrina" was an illustration done by Mexican artist Jose Guadalupe Posada in the early 20th century, and has since become an iconic image for Day of the Dead. The drawing features a female skeleton wearing a huge, wide brimmed hat topped with mounds of fruit and flowers. Posada created it to parody the rich and fashionable in society, and let them know that they too were susceptible to. I have smelled this soap over and over and it smells so fruity and yummy, I just can't figure out what it smells like. I'm hesistant to use it because it smells so good. It's actually agave nectar with a ton of other citrus scents included. This is my favorite out of the Halloween collection, and I plan on buying more. I hope this soap stays around long after October! 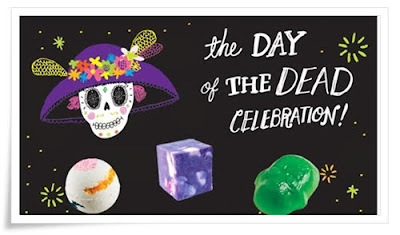 LUSH calavera ballistic Bath Balm ($5.93) Calaveras (skulls, in Spanish) are an iconic image for Day of the Dead celebrations. Day of the Dead is a Mexican tradition that honors and respects the dead. We were so inspired by the idea that this time of year could be filled with love instead of scary creatures, that our products are full of Day of the Dead imagery and ingredients. This is a mixture of marigold petals and zesty lime oil. This is a huge bath balm and sure to make you smell beautiful in October! Did I mention, this would make a fabulous gift? Everyone loves bath balms, and LUSH really knows how to create a balm that smells fabulous and looks beautiful. The LUSH Calacas Jelly ($4.95) is a spooky fruity wobbler filled with lime oil which is used to tone and decongest your skin. Although I haven't tried these, i think they are super cute and the most "Halloween" themed product out of the bunch. It's a bath bomb, not balm, and why would you say that you have "personally tested" the products and then just spew back the descriptions and marketing from the LUSH site and then admit you haven't even tried the jellies. Why bother tagging this as a review...when there's no review here at all.